Cindy Ames, a former NYPD officer, currently alternates between gymnastic teacher and security guard – a far cry from what she once was. Her most recent job – acting as a security liaison for the the mayor during a technology conference – was going to routine until things went wrong, very wrong. A local terrorist cell made an appearance and Cindy’s cop-instincts kicked into full gear to save the mayor. But soon Cindy is fighting for own her life – and losing. This wasn’t the first time he had to watch his wife be taken to the OR, but it was the first time he worried that it would be her last. Faced with the very real possibility that Jonas (Cindy’s husband) could lose her forever, he decides to take matters into his own hands and use an experimental drug to repair her broken body. Only the consequences leave Cindy a shell of her former self…that is until her thoughts turn to Jonas (and his team)’s semi-secret (and probably very illegal) super suit. “Some people are born to fight,” Jonas said. Whew – this was the dark-and-gritty superhero story I was waiting for! 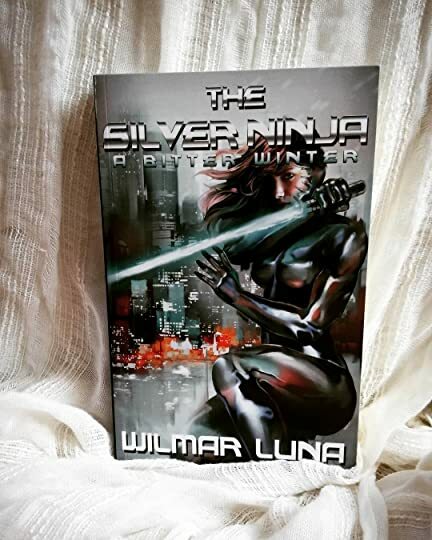 In the first installment of the Silver Ninja series, we getCindy’s origin story – complete with stealing forbidden tech, an evil “twin”, and evil secret corporations intent on ruling the world. What made this one stand out was the realism of Luna’s characters. Cindy’s problems were never magically solved by having the suit – well, sure she could actually kill the Big Bads much easier, but her personal problems were just as real and solid as before – it humanized this overpowering individual. The only thing that threw me out of the book was the science – it was a sticking point for me. I could tell that the author did quite a bit of research, but there’s always that fine line of what’s believable in the alternate reality and what’s stretching it. Most books I read toe that line, but in this one we were taking a few steps over. Maybe a leap or two (ohhhh…convenient memory losses…such a pet peeve…).